RUSH: Oh! I've been talking the last two days about watching this Democrat town hall with Tulsi Gabbard and Mayor Pete -- keep a sharp eye out for Mayor Pete, Pete Buttigieg or whatever from South Bend. Anyway, Cookie went back and got some of the questions, put a montage together of some of the questions. I'm telling you, it's a different world. It really is. The people on the left live in a different world, a completely different psychology. They're living their lives literally cowering in fear in the corners. They are scared to death. And the questions that they are asking these presidential candidates, it really is like listening to people that live in a different place. So she went back put montages together of some of the different questions. RUSH: So let's go back to March 10th. I had a guest in town for the local golf club member-guest golf tournament, and this was a... Let's see. This was March 10th. It was Sunday night. We were through playing golf. We're kind of wiped out. We play for four days in a row. We had the fifth day the next day playing the Els for Autism tournament. And my guest said, "Look, we gotta turn on CNN and watch this presidential town hall." I said, "No. If you want to watch that, go over to the house you're staying in and you watch." "No, no. You gotta watch it with me. You gotta watch this." I said, "I don't want to watch... Why do I want to watch two hours of CNN, period, much less a couple of people that are never gonna be elected president, never gonna get the nomination?" "'Cause I have to and I'm your guest." "Well, if you put it that way, you're right. The guest gets what they want." So we settled in, turned on CNN, and it was two hours of this town hall at the South by Southwest arts and crafts fair, whatever the hell it is. It's a bunch of leftists showing up doing arts and crafts and complaining and whining and comparing their latest tech. 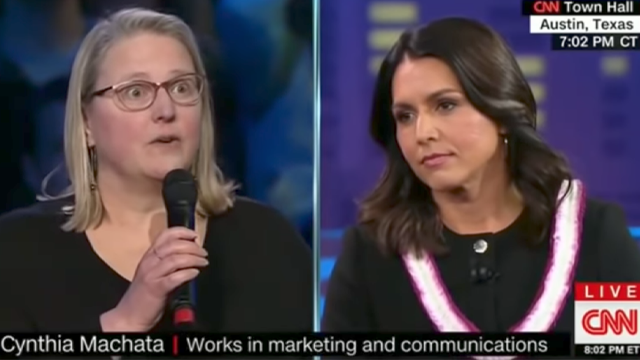 So I watched this, and the first hour was Tulsi Gabbard, who is a member of Congress from Hawaii. And the second hour is Pete Buttigieg, Pete Buttigieg, Pete Buttigieg. 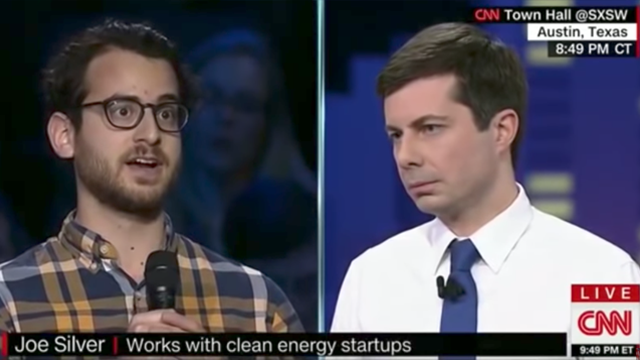 They spent five minutes on the pronouncing of his name, by the way, on this town hall, from South Bend, Indiana. He's 37-years-old, openly gay, very popular among people on the left -- dark horse, very articulate kind of guy. So we settled in to watch this, and I don't know what I expected, but I'm glad that I did. I'm glad that I did. You know, because I sit here every day, and I know who the left is. I know who they are. And I know their psychology better than they do, and I understand what it is that drives them. I understand liberalism better than they do. But it was worthwhile to actually see this. Remember, now, this is a legitimate presidential campaign event. Yeah, there are 16 or 20 Democrats that want the nomination, and every one of them is being given a lot of opportunity on cable news networks to be discovered. I had heard about Mayor Pete, but I had never seen him, and I knew of Tulsi Gabbard. I've seen her. I've listened to her. But, man, what an experience. Tulsi Gabbard, for example, had one theme -- and my buddy and I, we were not doing the drinking game. We were smoking cigars, so we had a puff game. Every time she said something, we puffed on the cigar. The word was "service." "I want to serve. I'm here for the service." We began... Every sentence, she mentioned service or serving or something -- and she had this pained smile on her face. She was trying to smile but conveying at (sobbing) "the same time that she was just in such pain over all the suffering, over all the suffering that's going on in America. The struggle!" It reminded me every time I saw Michelle (My Belle) Obama make a speech in the first two to three years of the Obama administration. Every speech, the theme was overcoming "the struggle." Every audience she addressed, it was "the struggle," whatever it is. The struggle is to survive in this godforsaken country run by a bunch of Republicans. Then they got to the audience Q&A, and this is when I had it confirmed that they are in a different world. They live in a different country; they want a different country. Their existence, their day-to-day existence has nothing in common with you and me, these people that are gonna vote for the Democrat nominee. I was prepared to come here and recite from memory the various questions that I remembered these people asking. So Cookie went out and put together a montage of some of the questions that both of these candidates got. We'll do Tulsi Gabbard's first. 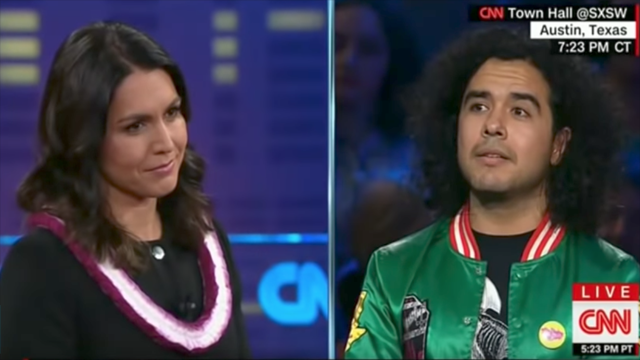 Again, Sunday night, March 10th, CNN Special Presidential Town Hall Event with Representative Tulsi Gabbard. I think Jake Tapper... Yeah, Jake Tapper moderated one of these, and Dana Bash did the other. We're not gonna have any of the candidates here, just the questions from the attendees, potential Democrat voters. BETH: I'm troubled by the increase in both Islamophobia and anti-Semitism. What can you do in terms of policy and position to combat racism and bigotry? SETH: Can you convince me that your prior positions on gay rights have truly changed? I'm especially concerned about your previous support of conversion therapy, which I find really, really repulsive. JOY: I'd like to know what you would like to do to stop sexual assault in the military. PAUL: We will suffer catastrophic consequences of accelerating global warming. With what urgency will you address it? TAYLOR: What do you believe has been the biggest policy mistake of the United States since creation? LIANA: I'm wondering if you end the War on Drugs by decriminalizing all drugs? JOHN: Can you beat Donald Trump? RUSH: I wish, folks, that you could see these people and their facial expressions -- the pain, the fear. But more than that, it is what they expect out of a president and what they expect out of the government. (sobbing) "What can you do in terms of policy to combat racism and bigotry? Oh, my God, what can you do?" (interruption) Well, The Ponytail Guy set the stage for all this, you know, in the debate between Clinton and Perot and Bush 41. You know, "You guys are our father. You're gonna take care of us! Which one of you is gonna do the best job? This was that. This was The Ponytail Guy on steroids. "Can you convince me your prior positions on gay rights have changed? I'm especially concerned about your previous support of conversion therapy..." This was for Tulsi Gabbard. Her face turned ashen. Her smile turned into a very serious, pained frown, and she begged for forgiveness for ever having thought anything like conversion therapy was possible (clapping) and they erupted in applause. Every one of these questions is rooted in personal fear. These people are walking around literally frightened every day. They're frightened of being alive. They're frightened of all the external events that you encounter in life, and they're asking these presidential candidates (sobbing) "to make it all good! Please, can you make it safe? Please, can you stop making us feel scared? Can you do the things that will make us feel safe? Can you make mean people stop being mean?" Just the kind of things that nowhere in our world would we ever want a politician to take control of and deal with. These are all things that happen in life, and you deal with them with your own group -- your families, your support group, whatever. You deal with it with your own command of life and overcoming adversity, but these people have no concept of any. They want everything done for them! They want to live in a bubble where no uncomfortable words, situations, even exist! (sobbing) "I can't deal with it!" And then, "Well, I don't know what you would do to stop sexual assault in the military," and there was more to this question. There was a recitation of some experiences in the military, sexual assault. It was gay sexual assault, by the way, and person wanted to know what... And of course, the politicians -- these people -- have to have an answer for this. "Well, you know, I want to serve, and part of my service is to ensure that there isn't any sexual assault anywhere, in the military or otherwise. "Sexual assault is a horrible thing. It's one of the most horrible things that can happen to anybody, and I want to wipe it out, and I'm gonna make sure that if you go to the military to serve our country -- as I am trying to serve our country -- we're all here in service. You do not deserve to be assaulted." The audience is going (applauding), "Yay!" Now, I'm not mocking being assaulted sexually, or any of that. This is the kind of stuff... None of this, none of this is policy related. None of this is anything about the things that ought to be considered when choosing leadership, presidential or otherwise. "We will suffer catastrophic consequences of accelerating global warming. What urgency will you use to address it!" (impression) "I'm gonna make it my number one priority. I am here to be in service, and part of being in service is to serve the issue of global warming." And then there are examples of in Hawaii, a false nuclear missile alarm went off and how frightened people were. "We can't have this anymore! We can't have false alarms. False alarms can't ever happen again. Whoever falsely alarmed a nuclear missile coming into Hawaii needs to be canned and never hired again. "People were so scared! There were mothers throwing their babies in sewers. There were mothers..." Folks, it was just strange. Now, here are the questions for Mayor Pete. Mayor Pete Buttigieg or Buttigieg. Because nobody knows how to pronounce his name, they just call him "Mayor Pete." He is the mayor of South Bend Indiana, 37, openly, proudly, happily gay. He had the same themes. Automations are taking your jobs. People are dying in the ER! Veterans are coming home and going on welfare! Mike Pence is preventing gay people from being gay. RUSH: Stop the tape. Stop, stop, stop. Give me time. Recue that. How do you tactically propose that we avert an unemployment crisis? Keep Donald Trump in the White House. It's that simple! Look at what happened to unemployment when we got rid of Barack Hussein O! We have more job openings than there are people looking for work. But you notice, how do you tactically -- do you think she has any idea what the difference in tactically and strategically is? Do you think she knows what the difference in tactical nukes and strategic nukes are? How do you tactically propose we avert an unemployment? There is no unemployment crisis! Avert one? We've done that. We elected Donald Trump. Okay. Back to the top. I'll try to shut up during the rest of this. ANJALY: You have very effectively pinpointed job automation as a key pivot in our near future. How do you tactically propose we avert an unemployment crisis? KELLI: How do you think that this would affect the lives of LGBTQ people? NATASHA: Uninsured patients coming to the ER for primary care issues, patients who are sick. The system just seems broken. What changes do you intend to bring to America's health care system? ALICIA: What initiatives do you plan on creating that will ensure that our nation's most selfless men and women will be able to effectively leave service and transition into civilian life without needing to apply for social services? JAMES: Vice President Pence is obviously quite conservative. Are his views an aberration? SUSAN: Do you believe that Congress should begin impeachment proceedings against President Trump? DELANEY: What needs to be done to fix the democratic process in America? RUSH: Overthrow it! What do you mean talk about fixing the democrat process, we're gonna get rid of it because in the democrat process you people lose more often than not. “Vice President Pence is obviously very conservative. Are his views an aberration?” No. They're the majority. Deal with it. “Do you believe Congress should begin impeachment proceedings against President Trump?” Well, the answer to that was, “Well, of course we need to wait for the Mueller report. We need to see what various committees come up with. Do I support impeachment? I support the beheading of Trump, whatever it takes to get rid of him. Damn right.” Yay. Yay. It was a really valuable two hours. Ended up glad I watched it.